There is something quite magical about old growth forests. Trees that tower high overhead and surround you like giant sentinels of the past. This short, 1.5 mile trail is a wonder to all who get to experience it. The trail follows alongside the Ohanapecosh River and soon crosses it with a bouncy suspension bridge. (One way traffic, so be polite and take turns). Just beyond this the trail turns to a boardwalk that makes a loop through old giants. There are a great number of downed trees adjacent to the path, as the one seen above. Whether towering above or downed, these trees are amazing to see. The diameters of some rival that of a small car. There are signs along the way with information about the forest ecosystem, the varieties of trees and the ages of some. 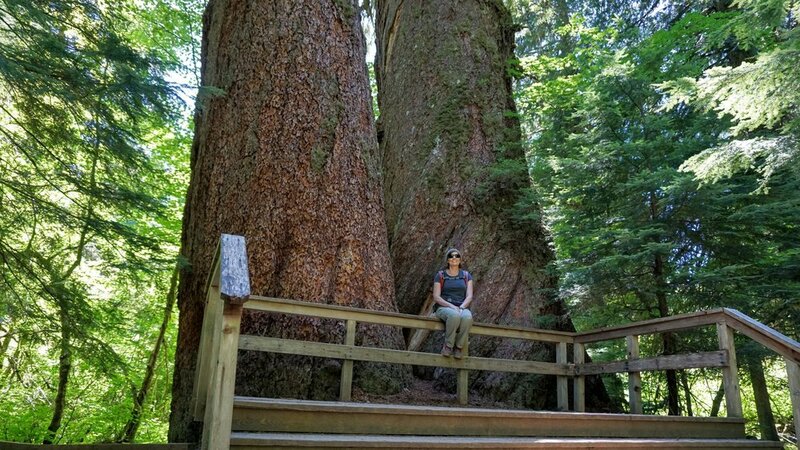 It's mind boggling to see 1,000 year old living trees, it's also humbling. With just a bit of imagination, one can picture the land that was once covered all around with these Patriarchs. Don't miss out on this wonder. Take the short stroll on this well maintained path to appreciated the forest that our forests are built upon. There are few places like this left!